What’s so special about this wrap? 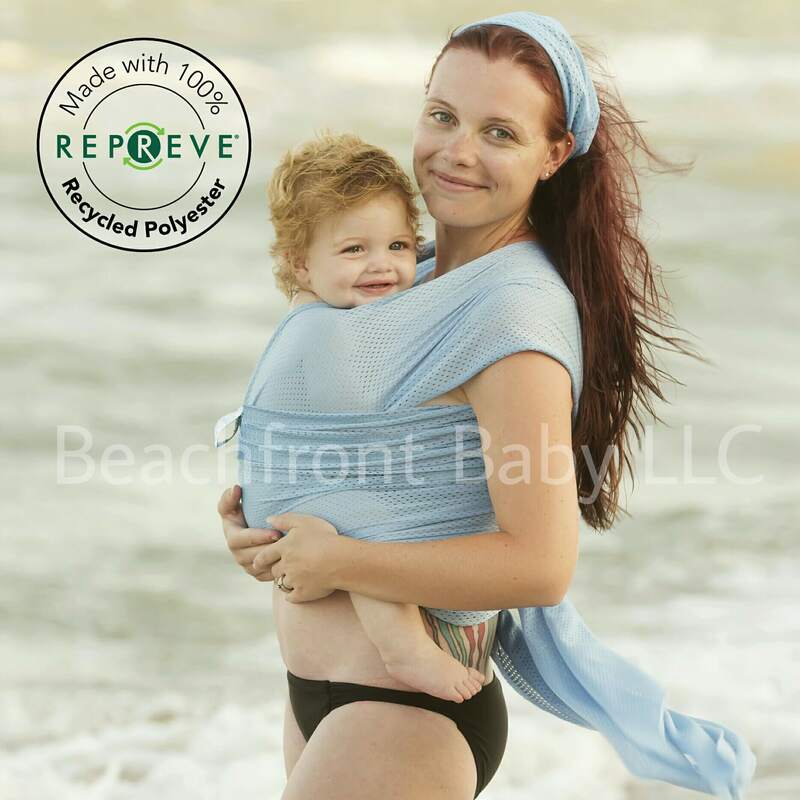 Each Beachfront Baby® Wrap made with 100% REPREVE® PC polyester contains approximately 15 plastic water bottles! Recycling plastic bottles can make a huge difference. Since 2009, REPREVE® has transformed more than 4 billion plastic bottles that have been recycled by you to make recycled fibers. Each Recycled Wrap comes with it’s own matching drawstring carry bag, which is also made with REPREVE®, and our packaging for this wrap is printed on 100% recycled paper. When you buy one of these wraps, you are helping us #turnitgreen! 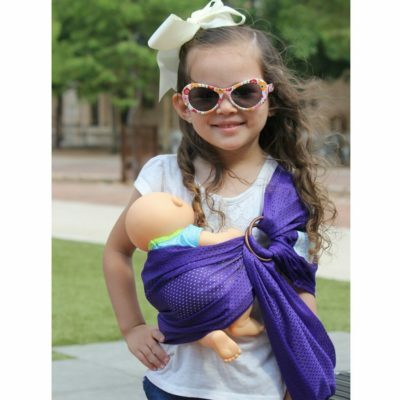 Made in the USA, all our carriers are sewn with care by work-at-home-moms in the San Antonio, Texas area. Our “one size” carriers can be shared by multiple caregivers so no confusing size charts needed! Available in Sky Blue as shown. The yarn used in our Recycled Wraps & Slings is certified to be free of harmful substances according to OEKO-TEX® Standard 100. 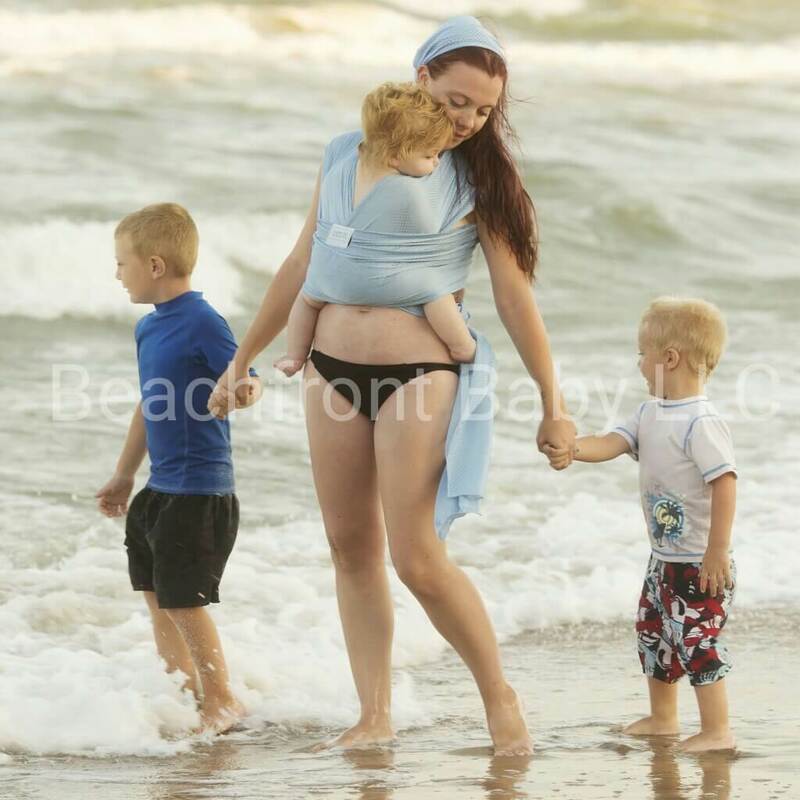 The fabric of a Beachfront Baby® Wrap feels like a lightweight, silky swimsuit which keeps it light in the water & allows it to dry very quickly. 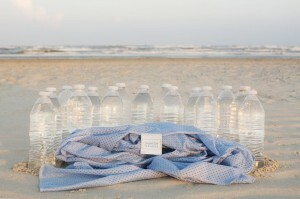 Wear baby in the shower, at the beach, at the water-park or in the pool. This especially comes in handy for keeping your hands free to play with or help older children in the water! Great for showering with a slippery baby! Can even be used as a sporty, everyday wrap! Unlike other water baby carriers, there are no buckles, snaps or neoprene- just a long piece of comfortable cloth with tapered ends. 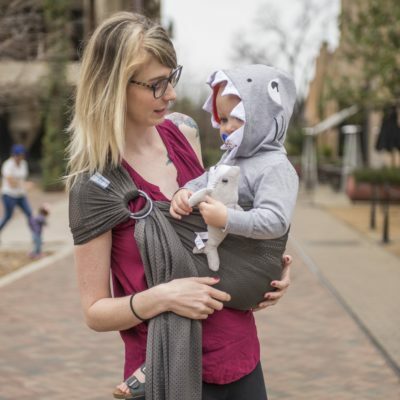 The wrap conforms to the wearer’s shoulders and back for a comfortable fit that is fully customizable for babies & parents of all sizes. Wrapping is a process much like tying your shoes- it takes practice in the beginning, but soon becomes second nature. 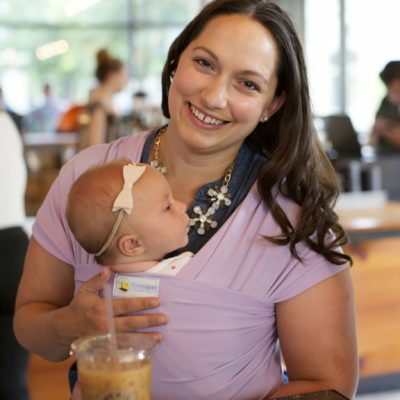 A wrap-style carrier places baby in the optimal position- high on the wearer’s chest and close enough to kiss. This is extremely important in any baby carrier but especially in any water environment. Beachfront Baby Wraps conform to ASTM F2907-14b- Sling Carriers- Mechanical Resistance & Safety Requirements as Verified by UL- ICQ Laboratory in Cabiate CO, Italy. This means that our wraps have undergone voluntary testing to ensure they meet the necessary safety requirements as outlined by experts in the fields of children’s product safety and babywearing safety. We want parents to feel secure in the knowledge that their babies are carried in the safest product possible and have all the knowledge they need to use the carrier safely. This is why our wraps include a full color photo instruction booklet with detailed written instructions as well as clear photos. 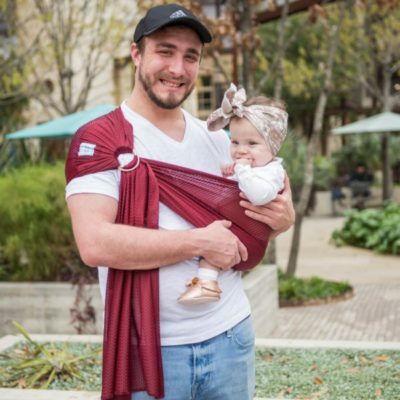 If you still need a little extra help, we have a YouTube video demonstrating how to put on the wrap and place your baby in it in the heart-to-heart hold. Each of our carriers include a safety & warning label with pictograms demonstrating safe versus unsafe positioning so there is always a visual reminder to the wearer of the carrier to keep baby safe.